"Upkari" is common Konkani terminology for a vegetable side dish which accompanies the main meal. There are perhaps as many types of upkaris as there are vegetables. Often, more than one vegetable is used in preparing an upkari. Some of the more common combinations are brinjal and drumstick, beans and potatoes and the like. 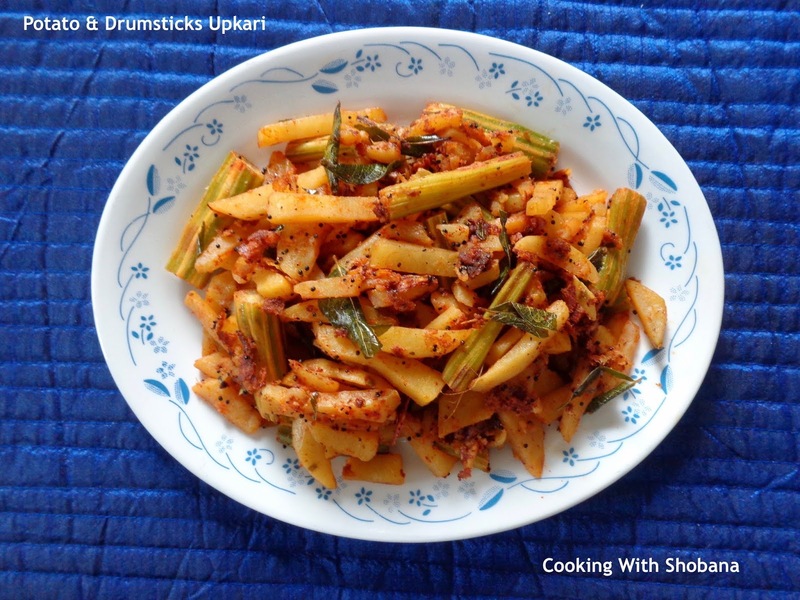 Today, I would like to share an upkari made of potatoes and drumsticks which is fairly simple to make. We call this, " Batata -Mashingasaang Upkari" in Konkani. Wash and peel the potatoes and cut them into longish pieces of about 1"
To know when the drumstick is cooked, press it lightly. If the seed pops out, this indicates the drumstick is cooked.